HPE ArcSight is a tool designed for collecting security log data. With the fast paced environment, it is extremely important to have a tool which can act at a lighting speed and collect threat details in order to mitigate data risks. ArcSight SIEM Tool is for security information and event management also known as HPE ArchSight SIEM tool which identifies the security threats in no time and allows the organization to work around the remedies in a quick fashion. It collects data from the various sources like applications, security technologies and operating systems and analyses it for the signs of any threats or compromise. If any such thing is detected it either sends out alerts to the administrators or generates an auto response on its own. What HPE ArcSight is used for? HPE security archsight is used for monitoring the various security systems in an enterprise for any potential security threat in real time. Identify Threats within a span of minutes before they impact the actual systems affecting the workflow. 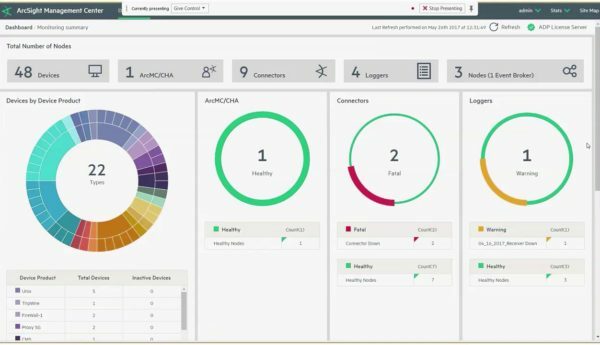 HPE ArchSight SIEM tool is highly recommended for automating and streamlining the reporting compliance. HPE security ArchSight is vastly used by enterprises to detect the triggers and indicators of threats which otherwise cannot be detected. Given its advanced technology, HPE ArchSight SIEM tool greatly improves the efficiency of enterprises in handling activities. With the help of HPE security Archsight tool the visibility to event management is increased. Without jeopardising the costs you can have a customised view of the detailed threats. The console is the interface based on workstation for ArcSight manager providing in-depth investigative capabilities and completely automated responses to the security events occurring. It also aids with developing resolutions for security events. The ArcSight console provides the administrator graphical representation of data of the security events, which further supports them in developing resolution and anticipating any further security threats. The ArcSight console can only connect with a single manager at any given time and requires an active network. The OS is a part of the architecture. It is mainly responsible for collecting all the security data from various systems and correlates and processes them. It is located at the centre of ESM and acts a binding link between other components. ArcSight manager is completely dependent upon the operating system for storing error logs and system configuration files. It is designed to establish relation with other system managers to allow data sharing. For ArcSight tool to send any notification or alert via mail, it is important it must be connected to outgoing mail server. It is the location which stores all the configuration and data log files related to security management of an enterprise. CORR Engine stores data file on the operating system where ArcSight manager is also hosted. ArchSight manager communicates directly with the CORR Engine for any data validation or transfer. The Archsight command centre is a web-based interface for managing and storing security data. It is responsible for various activities like storing and generating reports, managing licences and component authentication. With the help of content management it is possible for an authorized user to develop relationship with other peers and communicate with each other. The service layers APIs cater to multiple clients with the help of service-oriented architecture written in different languages and aids the developers to run reports and feed it to third party systems, management of resource groups and creation and updating of cases. Arcsight security provides customised and productive reporting which is universal across all functions. The reports and dashboard reflect all the compliance and security related data at one place and further aids to act accordingly. ArcSight security is one of the easiest and quickest tools to deploy. It takes as little as 12 minutes for complete configuration and within a day you are good to go with the live data. You can have a 360 degree view of your data which can be correlated. It provides defence against any unexpected failures and requires no downtime for any updates. This ensures your data is secured round the clock. For any tool to perform to its full accuracy, it is important for it to be fed with contextual data. ArchSight security tool does the same. It provides the user with factual and content related awareness in such a manner that they can develop and perform well-informed and relevant decisions. This not only supports in-depth data investigation but also ensures the actions developed are accurate and speeds up the process. The toll collects security data from carious systems hosted in an enterprise and converts all the different files into one single user friendly version which can be universally accepted. It helps the user to identify the threats based on the priorities and the action developed based on the urgency. Arcsight has a rule based algorithm which can easily correlate various algorithms and events to each other and fast track security. The security engine eliminates any irrelevant data which can be a hindrance and increases the risk. ArcSight comes with customisable templates which can be well customised according to ones needs and relevance. The user can build own customised advanced reports relating to the security events and set rules based on it. HPE Archsight security tool provides complete protection to your data and reveals security events that cannot be detected otherwise. The threats can be detected before they attack the enterprise systems and compromise or disrupt networks. ArcSight tool also provides critical insurance against the attacks that can hamper and damage the organizational data. HPE ArchSight siem is a licence-based product and can be purchased based on the needs and requirement. Being suitable for vast enterprises and packed with the best features, it comes with a price tag. The HPE ArchSight SIEM price can be availed directly from their trusted vendors like eSec Forte. We will provide you the complete pricing based on the add-ons and packs you opt for.